Fans of H.P. 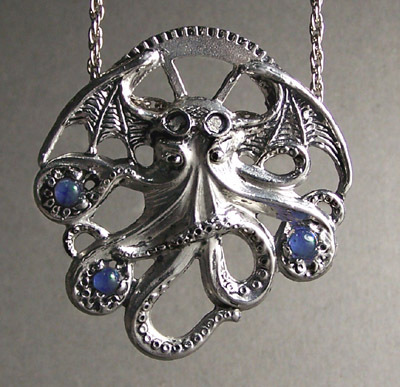 Lovecraft, Steampunk, or just the weird and wonderful will love our interpretation of the "Great Old One" Cthulhu. Sci Fi fans know that though he cannot be described, statues showed him with an octopus head and dragon-like wings. We've shown his halo, "the devine gear of the universe". We cast the the crystal balls right into the molten lead-free pewter. The rope chain is included.